Famed graphologist, Guraku Gakusha, has admitted to feeling very jittery since a local reporter detected an ominious figure in the studio audience of a show where Gakusha was a featured guest. Ormiga Hernandez, a reporter for the Canoga Park Chronicle, used facial recognition technology to follow up on a hunch about Gakusha's recent appearance on the Dr Phillip show. "I was watching the show, and as they panned across the audience, I got this weird feeling that I should take a closer look, so I did just that," said Hernandez. By repeatedly scanning various segments of video tape, the computer identified one audience member who was wearing sunglasses, an orange baseball cap, and not smiling at all. According to Hernandez, "The computer is 99.9% sure that the guy in the orange hat is Billy Plimberton. He was right there in the audience." 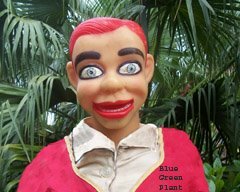 The Bluegreenplant reporter mimed the tipping of an imaginary hat and shook hands with the Canoga Park reporter, "Nice reporting," he said, "I tip my hat to you." "Thanks," the Canoga Park journalist responded. "Oh, and one more thing." "Yes, I know." The Bluegreenplant reporter rolled his eyes, stuck out his tongue, and mimed a knife going across his throat. "You must be scared." "Scared? What do you mean?" "No, no, nothing. What were you going to say?" "Well, there's just one more detail I wanted to share with you." "When Dr Phillip walked out of the studio with Robin, the guy didn't even applaud." Plimberton was the culprit identified by Gakusha as the author of the threatening graffiti which appeared a few days before the Speigleman mansion was obliterated by mortar fire. Maybe he was upset and didn't see the applause sign. I don't think Dr Phil would resort to an applause sign. He is far too folksy for that. Nobody is safe from Naptimez Ova.